The Nissan Sentra compact sedan offers an impressive level of fuel-efficiency, reliability, and standard features at an affordable price. If you’d like to stretch your money even further, you should consider purchasing a used Nissan Sentra. These durable and efficient compact sedans are available at Grecco Used Cars, located in Rockaway, NJ and serving Newark, Paterson, Elizabeth, and Chestnut, NJ. The Sentra is a great option for drivers young and old who are seeking a capable and reliable compact sedan at a value price. Every Nissan Sentra comes standard with front-wheel drive and a fuel-sipping 4-cylinder engine, and choice of an automatic or manual transmission. Standard features on the Sentra include air conditioning, dual front airbags, tilt steering wheel, rear window defroster, and an AM/FM audio system. 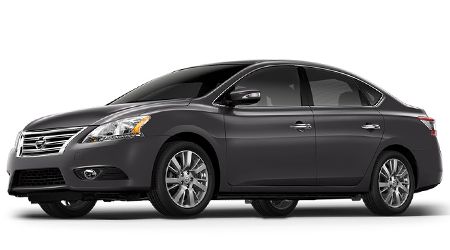 For additional comfort and refinement, you can have your Nissan Sentra equipped with leather-wrapped steering wheel, remote keyless entry, larger diameter alloy wheels, and an upgraded audio/speaker system. At Grecco Used Cars, we have a large selection of used Nissan Sentras available in stock. If you’re looking to get into a used Sentra at the lowest price possible, check out one of our older model year Sentras that still offer the fuel-efficiency and reliability that you’d expect from a Nissan vehicle. Our nearly new, late-model Nissan Sentras are a great option if you want the latest technology and features but don’t want to pay a new car price! With such a diverse selection of Nissan’s compact sedan located on the Grecco Used Cars lot, you’re bound to find a used Sentra that you’ll want to drive home. Used Nissan Sentras are very reliable cars, but you can have even greater peace of mind by purchasing a Certified Pre-Owned (CPO) Sentra at Grecco Used Cars. Certified Pre-Owned Nissan Sentras have under 80,000 actual miles and are no more than six model-years old. Every Certified Pre-Owned Nissan vehicle has passed a rigorous 160-point inspection and an Autocheck Vehicle History Report. Nissan CPO vehicles are backed by a 7-year/100,000 mile limited warranty that covers over 600 vehicle components including the powertrain. When you’re ready to get pre-approved for your Sentra at Grecco Used Cars, visit our website and complete our simple, four-step application. Our Finance team will review your application and then contact you with financing options tailored to your unique financial situation. Don’t worry if you have less-than-perfect credit; our dedicated Finance staff have experience getting our poor credit customers into the next vehicle with ease. If you’re near Newark, Paterson, Elizabeth, and Chestnut, NJ, and are searching for a used Nissan Sentra, visit the Grecco Used Cars showroom or visit our website today. We’ll get you behind the wheel of a used Nissan Sentra at a great price!